No one could successfully argue that the British Virgin Islands aren’t exotic…but perhaps the most exotic of this jeweled cluster of islands is Virgin Gorda. Famous for her volcanic landscape and laid back yacht clubs, Virgin Gorda lives up to her reputation as the Queen of the Islands. A strong hold for famous pirates and their ill-gotten gains in the 1500’s, the island was christened by Christopher Columbus as Virgin Gorda, meaning “Fat Virgin” because of it’s shape. Thanks to it’s rocky outcroppings, the island is said resemble a lady lying on her side. Virgin Gorda is the third largest island in the British Island chain at 10 miles in length and 2 miles in width, but she remains rustic, quiet and unspoiled, despite her size. Virgin Gorda’s vibe is truly unique. The laid back feel of the life and people on Virgin Gorda make it the right choice for a quiet and tranquil vacation. Accommodations on the island vary from modest to luxurious, so no matter the budget, there’s a place for you. Are you a boat lover? Then Virgin Gorda is your Nirvana, as it is home to some of the most outstanding yacht clubs in the world. Neighboring islands include tiny Saba Rock, and Richard Branson’s Necker Island, so you never know who you might see on a barstool next to you. To get to Virgin Gorda, you can fly or arrive by boat. Flights are available from St. Thomas and it takes only 40 minutes. The ferry from Road Town on the island of Tortola makes four round trips a day, so you won’t have any trouble catching a ride. Or, you can make Virgin Gorda your main destination on your private St. Thomas boat rental. There are several ways to get around the island. There are open-sided safari buses that travel along the island’s main road, which can take up to 14 passengers. Car rental services are a great choice if you prefer to drive. And finally, boat charters will take you from one tourist spot to another with style. 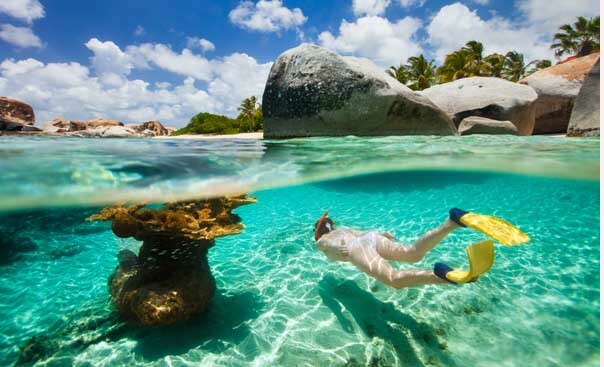 The Baths on Virgin Gorda are the first place you should visit when coming to the island. Home to the island’s best beaches, the area’s main attraction is the series of natural pools formed by giant granite boulders. The rock grottoes are filled with seawater that allow exceptional snorkeling, or private pools for soaking. If you love to hike, there is a 15-minute trail from The Baths to Devil’s Bay National Park. The Virgin Gorda Peak National Park offers hiking paths that crisscross the park’s large stretches of undeveloped land. It takes 20 minutes to reach the peak where you can marvel at the idyllic views of the sweeping bays and the countryside below. If you want an unparalleled view of the island, there is a tower at the summit that you can climb. On the south side of the island, hike to the Copper Mine ruins, which are now protected by the National Park Service. There are so many things to see and do on Virgin Gorda. With the island’s laid back feel, gorgeous beaches, exceptional snorkeling sites, secluded hiking spots, and historic ruins, you can be sure to get the vacation experience you’re after.